WASHINGTON – The words “Pyung-hwa-ga Yoroboon-gwa hahm-ke” (“Peace be with you”) greeted Washington Archbishop Donald W. Wuerl as he welcomed Korean Catholics from Virginia, the District of Columbia, Maryland, Philadelphia, New York and beyond to a special Mass Sept. 22. Commemorating 100 years of their ancestors’ migration, Korean-American Catholic pilgrims filled the Basilica of the National Shrine of the Immaculate Conception for the Sept. 22 dedication of two bas-reliefs that symbolize the permanence of their place in the Catholic Church. Cardinal Nicolas Cheong Jin-suk of Seoul, South Korea, joined Archbishop Wuerl, Bishop Paul S. Loverde of Arlington Va., and Monsignor Walter Rossi, basilica rector, along with nearly 50 priest concelebrants for the afternoon Mass. Also present were Father Bongwon Choi, president of the North American Conference of Priests for Korean Ministry; Father Peter Chung, a representative of the Korean bishops’ conference; and Korean Ambassador Lee Tae-sik and his wife, Suk-nam. Father Paul Lee, the pastor of Epiphany Parish in Washington who helped plan the event, also was a concelebrant. The newly unveiled works of art sparked waves of applause throughout the basilica. 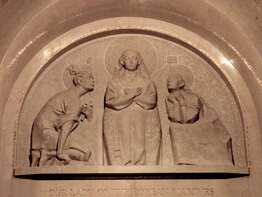 They were installed opposite one another in the shrine’s narthex – with Our Lady of the Korean Martyrs in the west tympanum, which is a semicircular space, and Our Lady of Korea at Cana in the east tympanum. “It’s an honor to be here,” said Ben Kim of St. Paul Chung in Centreville, Va. He felt inspired to see so many Korean Catholics together at the dedication. “Even though we’re all spread out (geographically), we’re all here together in one spirit,” he told the Catholic Standard, newspaper of the Washington Archdiocese. The Washington metro area is home to the third-largest number of Korean immigrants in the United States, behind Los Angeles and New York. Korean-American Catholics contributed to the sculpture project, which took four years and cost about $1 million. A gift to the national shrine, the bas-reliefs symbolize the faith and love of the Korean Catholic family and serve as a sign of gratitude for the heroic examples of faith witnessed by their ancestors and passed down to them. During the Mass, a prayer was offered for the Korean Martyrs who gave their lives for the Catholic Church, which was established in overwhelmingly Buddhist Korea in 1784. The tradition of martyrdom began almost immediately and claimed more than 10,000 lives over the next 100 years. In 1984, Pope John Paul II canonized 103 martyrs in Seoul. In 2002, Father Lee petitioned the shrine’s rector for a place where Mary could be honored by Koreans. The following year, with the initiative of the North American Conference of Priests for Korean Ministry, the U.S. Conference of Catholic Bishops proclaimed Sept. 23, 2003, to be Korean-American Catholic Day to commemorate the centenary of Korean immigration to the U.S. The proclamation came during a Mass attended by nearly 6,000 Korean-American Catholics. During the Sept. 22 dedication, Monsignor Rossi thanked Father Lee, project chairman, and Peter Choe, executive director of the California-based North American Conference of Priests for Korean Ministry, for their efforts to ensure that the two images of Our Lady of Korea became a reality. In a statement, Father Lee said the Gospel continues to bring hope to Korean Catholics today, and the faith there and among its immigrant community continues to grow. He said the two sculptures honor that legacy of faith. Sculptors Euisoon Choi and Songja Rim in Korea created the clay and plaster models, which were reviewed by the basilica’s iconographic committee and ultimately sent to Italy to be carved out of Botticino marble, Father Lee said in an interview before the dedication with the Arlington Catholic Herald, newspaper of the Arlington Diocese. The artwork is meant to share the history of the church in Korea, Father Lee added, as well as contribute to the unity of the church and share the faith and spirit of Korean-American Catholics. Contributing to this story was Gretchen R. Crowe in Arlington.